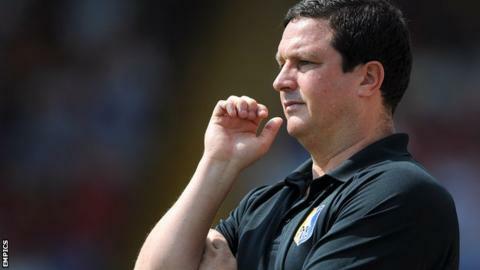 Torquay boss Paul Cox was sent to the stands after the "wrong player" was substituted in their loss to Woking. The Gulls wanted to take off Louis Briscoe for debutant Simon Heslop in the 68th minute, but striker Alex Fisher was replaced instead. The confusion appears to have stemmed from Briscoe wearing number seven and Fisher sporting the number 17 shirt. "All the referee needed to do was show common sense, which is sometimes hard for them," Cox told BBC Radio Devon. "The fourth official said the paperwork said 17, but it said seven. The whole thing erupted. "If he made an honest mistake just use common sense and rectify it, but instead he stuck his heels in and said the substitution had been made." "I saw number 17 flash up and Alex Fisher left the pitch, but the Torquay bench pointed out the error so he came back on and Louis Briscoe came off. "The game was going to restart but the fourth official showed a piece of paper to the referee, presumably saying Fisher's number (17) was written down. "There were heated discussions for a few minutes and the home crowd weren't happy. Briscoe had taken his shin pads off and sat on the bench but he had to get up and come back on. "Paul Cox kept arguing, so the ref sent him to the stands. The funny thing is Briscoe was subbed a few minutes later anyway." To make matters worse for Torquay, Ismail Yakubu headed a 90th-minute winner for Woking to consign them to their first home National League loss of the season. Football Association rules state a substitution is completed when the replacement enters the field of play, and the substituted player can take no further part in the match. "I'd actually run up to the halfway line to stop him (Fisher) coming off," added Cox. "I thought he was coming off for a drink at first, but I caught him as he placed one foot over the touchline. "It seems the night will be remembered from an officiating point of view, and that's disappointing at this level of football."